I work from my photography studio in Camberwell, London. It’s set up to make your dog (and you!) feel relaxed. Each shoot includes a full studio session (generally an hour long), plenty of water and treats, and patience! I want your dog to feel relaxed and let his or her personality shine through so we can even go for a walk beforehand in the local park. My role as a dog photographer means I combine all my tips and tricks to provide you with beautiful portraits. Before each portrait session, we can discuss your requirements, from how I can bond with your dog through to creative choices of lighting and backgrounds. 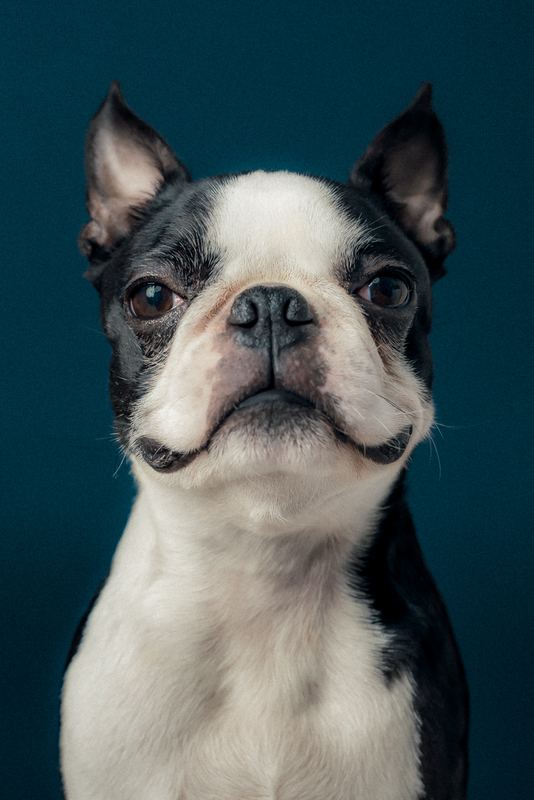 From dark and moody to bright and fresh, from deep crimson to creams and blues, we can chat about what you would like and what would suit your dog’s portraits. Following the shoot I’ll provide you with the full selection of images from our session. Then you can pick your favourites to create your final bespoke dog photography package (see below). I also offer different printing and framing options which we can talk about following our session; it’s always nice to have your photographs on display. I work with a framers which makes beautiful hand-made frames and a printers which takes time and care over each archival print. I think every little detail is important, it’s what makes your dog photography package unique. For an initial consultation, to ask any queries you have or to make a booking, either fill out the contact form on this page and I’ll get back to you as soon as I can, or contact me via email or phone via the links below. The basic session includes 5 fully retouched images of your choice, supplied ready to print both in colour and black and white. The deluxe session includes 10 fully retouched images of your choice, supplied ready to print both in colour and black and white. The premium session includes 10 fully retouched images of your choice, plus one 12x16” archival print. The premium location session means I bring my mobile studio setup to you! It costs £225 plus travel and includes 10 fully retouched images of your choice, plus one 12x16” archival print. I think each print and framing option needs to be bespoke - we can discuss your requirements before or after the shoot. All options are available, from 6x4” prints to huge 5’ wall-mounted frames and everything in between. Drop me a call or email at any time and let’s chat!